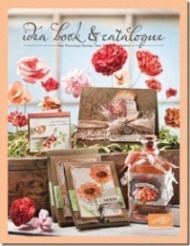 If you ever run out of ideas just take a look at the Idea Book & Catalogue for inspiration! I got this from page 19 and changed the colours. I made this card for a friend who lives in the UK. It is her birthday next week but I like to allow 1 week for delivery. 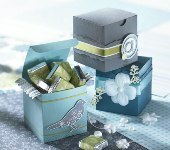 The stamp set is a level 1 hostess set when your workshop net total is $300+. You also get $30 of free merchandise to choose from too. Pretty good! I used my blender pens for the very first time and liked the result I got. I found it much easier to control the colour than using the aqua painter (but that is just me!). You might find that it is the opposite for you. It is Australia Day here tomorrow and we are having a BBQ with my parents and some friends. Thank goodness today is much cooler than yesterday's 41 degrees! That was just waaaay too hot. Stamps: A Little Bit Of Happiness, Happy Everything, Polka Dots. Paper: Night of Navy, Real Red, Old Olive. Ink: Night of Navy, Real Red, Creamy Caramel, Old Olive, Basic Black. Accessories: Dimensionals, Red Stripped Grosgrain Ribbon.